This is the oldest house on display, built around 1845. 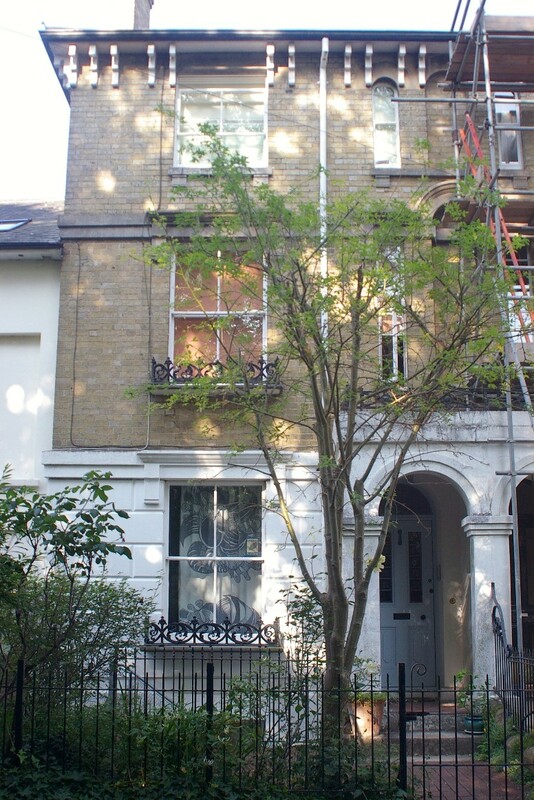 It is a four storey terrace house set in a conservation area. Lots of work has been done to improve the efficiency of the home without diminishing it’s character. This is a 4 storey terraced house with solid walls. The floor area is approx 168m². 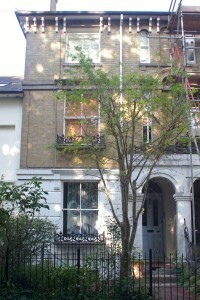 The studio at the end of the garden is approx 19m². The basement is a self-contained flat, except that the heating and hot water of the entire premises comes from one Combi condensing boiler, located in the upper dwelling. The studio is a timber framed & clad structure over a masonry car-port. The cladding is soft-wood weather boarding protected with Osmo breathing paint, supplied by the Green Building Co. Window & door frames in tropical hardwood from managed source. This is by Everest, E coated safety glass in polyester powder coated aluminium frames. 12 windows of very variable sizes, average cost December 2008 £ 467 per window. Whole installation done in one day, very competent. There was an error in the manufacture of 2 frames, which was corrected without argument, & they have since visited once at my request to advise on operation. The secondary glazing has greatly reduced heat-loss, noise disturbance and improved comfort levels. The inner sashes are entirely unobtrusive visually. Warning:- Do not accept their credit agreement offer with Barclays Home Improvement Account. It is a rip-off & you would do better to fund out of overdraft. Advice:- Though much reduced, you will still get condensation on the outer glass in Winter. We deal with this by putting packs of silicon gel in the void between the frames, obtainable from Rajapack they should be roasted to expel the condensate about every 4 weeks, weather-dependant. The roof of the main house is slate clad at a pitch of approx. 30°. This allows for insulation above the ceiling, an area approx. 35m². The ceiling rafters are only 100 X 50mm. Therefore we increased the depth by cross-battening (for minimal cold-bridging) with 200 X 50 joists, fixed with Batt connectors to every other ceiling rafter (for rigidity). The void thus created was then topped up, over the 50mm of vermiculite and 50mm of rockwool, with 200mm of Warmcell, loose-fill, cellulose fibre insulation. The whole was then over-boarded with moisture-resistant T & G woodchip flooring, continuously glued at the joints. This room, which is the largest in the house, was redecorated in May. I took the opportunity to apply Three in One damp proof foil, manufactured by Doric Anderton ltd. To the inside of the external wall. This was followed up with a heavy-duty lining paper, which was coated with Nano-emulsion thermal insulating paint, from Nutshell paints. When upgrading the basement flat in 1996 I took the opportunity to insulate half the main living area floor (which was at a sunken level) with 50mm of high-density polystyrene, over-boarded with T & G chipboard. The boiler is a Worchester 26CDi XTRA, gas fired, max output 26.0kW. It is a Combination boiler so there is no hot water storage tank. It produces hot water on demand. This means that it is incompatible with solar panels or tubes. Drayton TRV4 thermostatic valves are fitted on all rads. I am looking into installing 12.6M2 of PVs on the roof of our studio, at the end of the garden. The orientation and pitch are not ideal, facing slightly South of West at a 19degree pitch but the company quoting think it will probably be worth it. The location has the advantage of no shading and full accessibility. The studio is heated by a Clearview, wood burner. This is a UK designed & made stove, designed to continue burning at a slow & even rate of combustion, that is suited to a temperate climate. Purchased from the Newforest Woodburning Centre. The flue rises free-standing in the space, giving off heat. We have 2 of these which control the computers, the monitor, the TV and the main light in the living room. The make is Byebyestandby. We have two containers, one for vegetable and kitchen waste & the other for leaves. We add brown paper and cardboard to both & the open leaf one is a favourite refuge for frogs. Almost all our lighting is by CFL, including the external lights. Most of these look like tungsten bulbs. Our Energy suppliers, for both electricity & gas are Ecotricity. This company are gradually moving to feed an increasing proportion of gas from bio-digestion into the mains. Over a 6 year period they have averaged £ 387.93 per customer invested in renewables. This makes them the top of a league table of 9 companies in this regard.